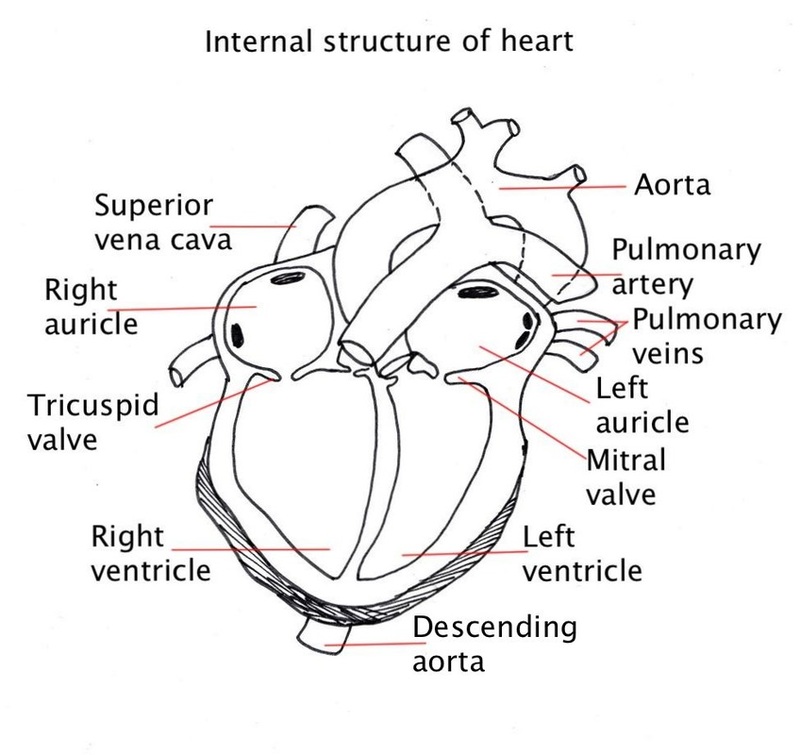 6.2.1 Structure of the heart. 6.2.4 Control of heart rate. 6.2.5 Structure and function of arteries, capillaries and veins. 6.2.1 Draw and label a diagram of the heart showing the four chambers, associated blood vessels, valves and the route of blood through the heart. Heart has collecting chambers for the blood moving in from the veins. These are thin walled muscular chambers called ATRIUM. Heart has thick walled muscular chambers that builds up pressure to send the blood out with a force. These chambers are called VENTRICLES. -----Larger Veins------Inferior vena cava that takes blood back to the heart. The right side of the heart sends blood to the lungs (the capillary bed). This is the PULMONARY CIRCULATION. The left side of the heart sends blood to all parts of the body organs (capillary bed). This is called SYSTEMIC CIRCULATION. The flow of blood is from atria to ventricle that is guarded by artrio-ventricular valves and from ventricle to the outside that is guarded by semilunar valves. The walls of the ventricle are thicker than the atrium. The wall of the left ventricle is thicker than the right ventricle. The muscles of the heart do not receive nutrients and oxygen from the blood in the chambers heart. The muscles of the heart are supplied with a system of blood vessels. 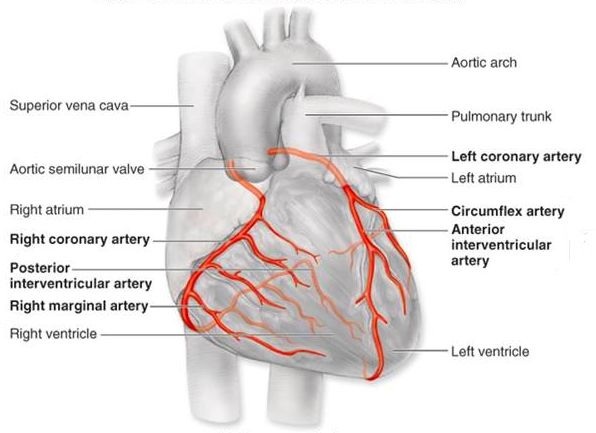 This is called as the coronary circulation. These are the branches of the aorta. The heart muscles receive nutrients and oxygen from these blood vessels. An RBC has a life span of 120 days. Consider your self to be an RBC trace alt east four possible circuits that you would complete during this time. Find out the name of the artery that lead to different organs and the veins that carry them back to the heart. 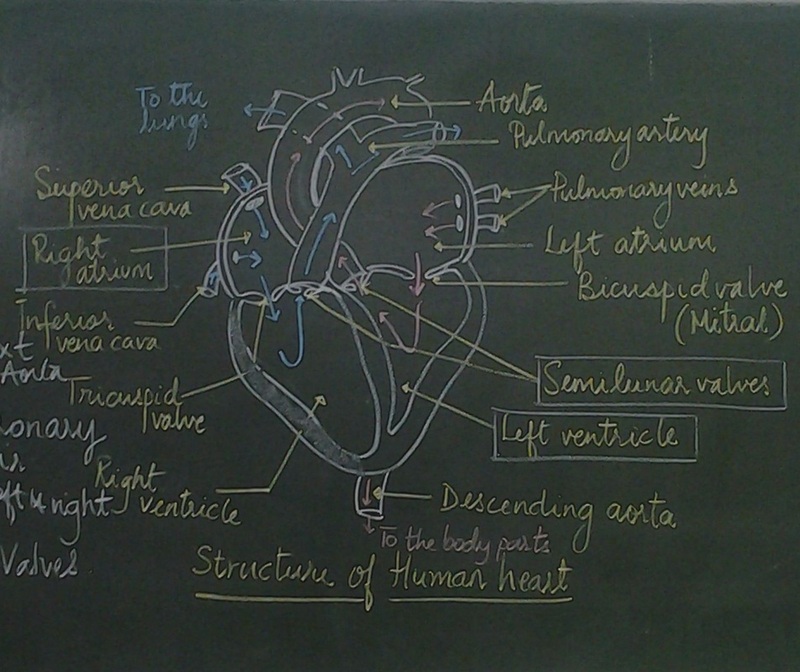 6.2.3 Explain the action of the heart in terms of collecting blood, pumping blood, and opening and closing of valves. Atria collect blood from the vena cava and the pulmonary veins. Blood collected in the atria is pumped to the ventricles. The atrio-ventricular valves open and ventricles are filled with blood. The blood is then pushed out of the ventricles at high pressure, due to the thick muscular walls of the ventricle. The semilunar valves open to allow the blood to move into the arteries. The atrio-ventricular valves close at this time to prevent the back flow of blood into the atria. The left ventricle pumps blood into the aorta and the right ventricle pumps blood to the lungs. The pressure generated by the heart causes the blood to move around the body. Heart valves working with atria and ventricles to keep blood moving in one direction and prevent the back flow. The human heart beats on its own accord, 60-80 times a minute (at rest). The cardiac muscle spontaneously contracts and relaxes without nervous control. It is known as myogenic contraction. The right atrium contains a mass of tissue in its walls known as the sino-atrial node. The pace maker or the sino-atrial node (SAN) coordinates the heartbeat. The right atrium also contains another mass of tissue called the atrio-ventricular node (AVN). The AVN receives a signal from the SAN and waits for 0.1 sec to send the signal further to the Purkinje fibres. This causes both the atria to contract first and then both the ventricles contract. The atria contracts first, and is followed by ventricular contraction. The electrical impulses cause chambers to contract. A nerve from the medulla oblongata of the brain can cause heart rate to speed up or to slow down. Adrenalin (carried by blood) speeds up heart rate. Artificial pacemakers are used to control the heartbeat. Observe the permanent slides of artery and vein. Observe the permanent slide of blood smear. 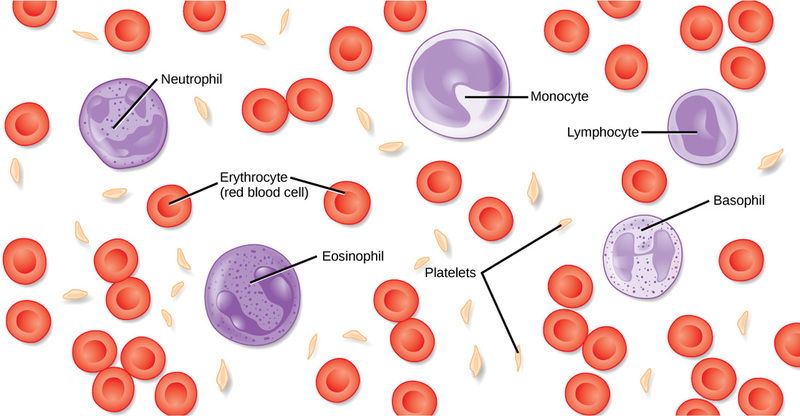 Try to identify the different types of blood cells and their features and write down your observations with drawings. Arteries have thick walls to withstand high pressure. This prevents bursting of arteries due to high pressure. Arteries have muscle fibres to even out blood flow and elastic fibres to allow artery wall to stretch/recoil. Veins- veins carry blood back to the heart from the tissues. Veins have thinner walls because the pressure is low. Veins have fewer muscle / elastic fibres because there is no pulse. Capillaries – These are the minute vessels that allow exchange of O2 / CO2 / nutrients / waste products from tissues. Capillaries have a thin wall to allow (rapid) diffusion. Capillaries have porous walls to allow tissue fluid to leave. Capillaries are narrow so can penetrate all parts of tissues, bigger total surface area. Blood consists of liquid part and the formed elements. The liquid portion of blood is called PLASMA. Blood transports substances in the body. 1. Nutrients like glucose, amino acids etc. 4. Antibodies- Involved in immunity of the body. 5. Urea- Nitrogenous waste that is filtered out by the kidney. All pictures have been downloaded from Google images for educational purpose only.